The Panfish Pheasant Tail Nymph swaps out natural pheasant tail fibers for some dyed flourescent orange. The pheasant tail nymph is a classic nymph pattern. Tied with its traditional materials of natural pheasant tail fibers and peacock herl it is a fish catching wonder. The color scheme of the natural materials does an excellent job imitating many mayfly nymphs. 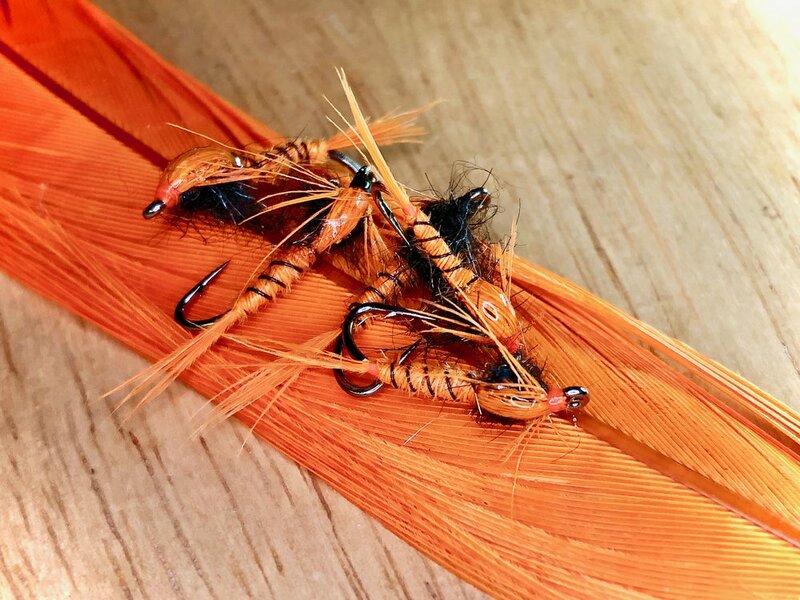 A pheasant tail nymph is a killer nymph pattern for panfish of all types. You may ask the question if this pattern works so well why mess with it? Truth be told there is no reason to. A well chewed Panfish Pheasant Tail nymph! It is well known that bluegills and other panfish respond to color. I have my own theories on what colors work best under what conditions that I won’t get into now. But to sum it up, panfish positively react to certain colors under certain circumstances. One color that often gets a rise out of bluegills is the color orange. I have long been including a touch of this color in my panfish patterns. This is accomplished by either by adding a hot spot or by emphasizing the color throughout the pattern. An example of a hot spot a can be seen in my recent post about the Creature. This is a drab colored fly that I incorporated a hot spot into. Comparing the pattern side by side with and without the hot spot, the fly with the hot spot seems to produce better. The subtle orange hotspot on the Creature definitely improved it's fish catching abilities. The second method I mentioned empathized the color throughout the pattern, which is what I did with the Panfish Pheasant Tail. Fluorescent orange can be a trigger at times, and this fly works well under those conditions. One of my theories concerning color is that bright flies perform well on sunny days. The increased light levels in the water really make these flies stand out attracting the naturally curious bluegill. I created this version of the pheasant tail nymph to attract fish on those bright, sunny days. The pattern produces well in both clear and stained water. Big bluegills appear to a have soft spot for that bright orange color! Another version of an orange pheasant tail nymph, this one borrowed from one of my trout boxes. Hot spots fore and aft make this fly particularly attractive to autumn brown trout, but it would also work well on panfish. My Panfish Pheasant Tail uses fluorescent orange dyed tail fibers. Sourcing this material could be problematic since I seldom come across fluorescent orange pheasant tail. The tails used here were purchased from an overseas source. Veniard's out of England is my source for this material, but a recent search of their site did not show the bright orange dyed pheasant tails in their inventory. Fortunately, pheasant tail fibers are routinely dyed in a whole host of colors. It is easy to find colors like orange (non-fluorescent), yellow, green, purple, red, etc. all of which are attractive to panfish under the right conditions. The contrasting colors of the Panfish Pheasant Tail are very attractive to bluegills and other sunfish. I find that contrast is also an essential feature in an effective panfish pattern. I believe it makes the fly more visible to the fish. The black thorax section and ribbing on this fly creates an excellent contrast against the bright orange abdomen and shell back. You could also stick with the peacock herl, often used in the original pheasant tail nymph pattern as it also provides a little contrast and you just can’t beat the fish attracting features of peacock herl. Also, you can find peacock herl dyed in a range of colors if you wanted to experiment even further! By changing thread color you can clearly identify which flies are weighted and which flies are not with out changing the overall apperance of the fly. I tie this pattern both weighted and unweighted. To identify which flies are weighted I use different color threads. In this case, I used orange thread for unweighted and black for weighted. The fly is reinforced by black wire ribbing and a drop of UV resin on the wing case. The wire and the UV resin will protect the delicate pheasant tail fibers allowing the fly to withstand the of catching multiple fish. One of my favorite ways to fish this pattern is as a dropper on a popper/dropper rig. It also works well as a general searching pattern. The hi-vis color great makes it a great choice when sight fishing to visible fish.